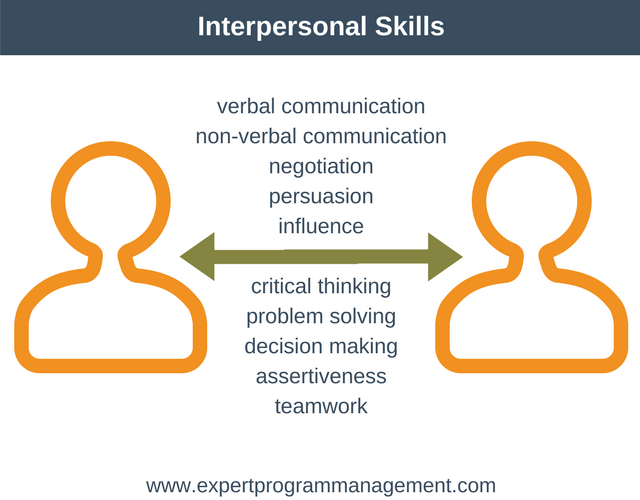 1 What are Interpersonal Skills? Interpersonal skills are defined as the ability to communicate or interact with another person. They are skills (often called soft skills or life skills) that we use every time we interact with someone else, either individually or as part of a group. Everyone is of course different. You may know someone with great interpersonal skills, and another person lacking some interpersonal skills. People with great interpersonal skills are generally more successful both professionally and personally than those without. In today’s job market, having great hard skills is not enough, employers increasingly want people with great interpersonal skills. The good news is that it’s possible to improve your interpersonal skills. Interaction with other humans is a fundamental part of being human. Each of us has been developing our interpersonal skills from an early age, beginning almost as soon as we are born. This means that each of us has, right now, a baseline set of interpersonal skills at our disposal ready to deploy. Because everyone already has interpersonal skills, and because we use them daily, it can be easy to take for granted the need to improve our interpersonal skills. Another barrier to developing great interpersonal skills is that, because there are so many of them, it can be difficult to know where to start. The good news is that in this article we’ll help you to identify the most important areas for you to improve. Consider an example where you get on a bus and immediately the driver tells you the fair is $1. You hand over $1 and go to find a seat. Is this interpersonal communication? No, because you handed the interaction in an automatic way. You interacted with the bus driver as an “it” rather than a “you”. To be an interpersonal communication you’d need to interact with the bus driver almost as if you know them in a “you” way. Another important point to note that interpersonal skills are not quite the same as communication skills. Mostly they overlap, but the area of interpersonal skills is broader as it includes topics such as team working and group problem-solving. Interpersonal skills can even give us the ability to ask for help when the situation demands. From this huge list of interpersonal skills benefits, it’s easy to see how sharpening your saw in this area can help improve both your personal life and your business life. Clearly, the topic of interpersonal skills is a very broad one, so the challenge is that with so many interpersonal skills in existence, how do you determine which skill to improve? At the bottom of this article, you’ll find a list of first steps to improve your interpersonal skills. In this section, you’ll find a list of interpersonal skills. You may notice that there is some overlap between skills, for example, displaying a positive attitude is about what you say (verbal communication) and also your body language (nonverbal communication). Competent and engaging public speakers tend to be more successful both in the workplace and in life. Giving an effective presentation is about more than just delivering your message confidently, it’s about getting your message across in a clear manner that keeps your audience engaged. Obviously, improving your public speaking will take practice. Fortunately, there are tools available which can help you construct your presentation more effectively, such as Monroe’s Motivated Sequence and The Rhetorical Triangle. Having a positive attitude is all about being optimistic in your everyday life. This optimism will enable you to better handle daily stresses without negatively impacting your mood or the moods of those around you. In a nutshell, having a positive attitude will improve your coping skills. Although everyone knows what a positive attitude is, not everyone knows how to go about developing one. One way is to develop the ability to catch negative thoughts as they pop into your head and replace them with more positive thoughts. As an example, if you’re feeling stressed because you have an impossible amount of work to do in the allotted time, then rather than getting stressed, how about turning it into an exciting opportunity to practice your prioritization skills. Fundamentally, self-confidence is about having belief in our own abilities. Self-confidence is important in many aspects of life. We may like to think that decisions in the workplace are based solely on logic, but think about this: would you prefer to invest your money in a project proposed by someone who mumbled and fumbled their way through a proposal in an unconfident manner, or all other things being equal, into someone who presented in a confident and charismatic manner? There is no instant way to improve your self-confidence, but a good place to start is to learn to manage negative emotions and learn about emotional intelligence. Empathy is the ability to understand and share the feelings of others. Empathy is about understanding the feelings of others as though we were feeling it ourselves. In a nutshell, empathy is the ability to understand another person’s emotions. You can learn more about empathy here. Active listening refers to the process by which we elicit information from either an individual or a group. The word “active” in the context of active listening means to draw out information from the person we are listening to. Paraphrasing to demonstrate that you understand the other person. Asking further questions in an understanding way to seek further clarification. In a workplace context, motivational skills are your ability or your strategies to generate the desired response from a peer, subordinate, or stakeholders. To develop your motivational skills it can be useful to understand where your power is coming from, as well as understanding stakeholder management. You can learn more about motivating others by reading about Equity Theory, Expectancy Theory, and Theory X and Theory Y. You all know someone who is great socially because of their use of humor. Appropriate use of humor can also make the cogs of the workplace turn more smoothly, as well as helping us to get what we want. The word appropriate is important in the above sentence. Inappropriate use of humor can have the opposite effect we desire. Remember to be serious when you first meet someone and pay attention to the cues you get from others about where and how the use of humor is appropriate. Feedback enables us to achieve our goals by constantly making small adjustments to our course. For feedback to be effective it must be given regularly and it must be constructive. Feedback cuts two ways, and you must be able to receive as well as give feedback. You can learn more in our guide to Giving and Receiving Feedback. Using pauses and stops to enhance the impact of what you are saying. This is just a list of a few of the more important skills, there are literally thousands of others. Just as important as the words you are speaking is what your body language is saying. Developing your nonverbal communication enables you to make a good impression, the first time and every time. As an example, if we were presenting a speech but were very nervous then this would be reflected in our body language as we might start to rush our words, rush our presentation, and lose eye contact. This nonverbal communication would be picked up by our audience and would reduce the impact of our presentation. As you can see, nonverbal communication skills are closely related to self-confidence. Using our hands and facial expressions to help articulate our point. Avoid using your phone or laptop when in meetings. Shaking hands firmly but not excessively. You can learn more about nonverbal communication here. Effective negotiation is based on trust and mutual respect and often results in win-win outcomes, where both parties benefit from the result of the negotiation. Persuasion and influence may seem to have somewhat identical meanings, but there is a subtle difference. Persuasion is communicating with someone to get them to do something, whereas influence is the ability to change how someone thinks to get them to do something. Essentially, whenever you’re changing the underlying way people think, it’s influence otherwise, it’s persuasion. Read More: about Influence and how to improve your political awareness skills to better understand people’s motives in the workplace. Critical thinking can enable us to solve complex problems, both as an individual and as part of a team. Just like all other interpersonal skills, improving your critical thinking skills with help you both in life and in your career. Critical thinking can be defined as your ability to take charge of your own thinking. It enables you to explore all possible angles of a situation so as you can make the best decision. It is about undertaking a rational process of investigation and research to make the best decision. Decision making can often come down to exercising your judgment. Being assertive isn’t about being forceful, but it is about being able to stand up for both yourself and others in a way that others can respect. To be assertive you need to be open and forthright as to your needs whilst respecting the needs, rights, and views of others. Because of this, assertive behavior is not aggressive behavior. Teamworking uses many of the skills we’ve already examined. It involves working within a group, contributing ideas, sharing responsibility, being assertive, giving constructive feedback, and learning from and accepting feedback. It’s about understanding how you fit within a specific team. Do you cooperate well with others, lead, offer support and advice, ease tensions, follow others, or just watch what’s happening? If you’ve reached this point in the article then you’ll realize there are a multitude of interpersonal skills that you can take steps to improve. The trouble is knowing where to start. That is because improving your interpersonal skills is a lifelong journey. There is always something that can be improved. Below, we’ve provided a quick start set of steps to help you improve your interpersonal skills. Have a positive attitude: it’s obviously not possible to be positive all of the time, but it is easy to practice it. Read about how removing limiting beliefs can help boost your attitude. Smile more: likewise for smiling. It can seem awkward at first but gets easier with a little practice. Why not try smiling at just one person each day to get started and observe how that changes the quality of your interactions? Practice active listening: again, start small. Try to actively listen to just one person each day by nodding when you agree with them, summarizing what they’re saying, showing empathy, and asking questions. Practice giving constructive feedback: giving constructive feedback doesn’t have to be difficult. You could start by simply giving some praise for a job well done and take it from there. Practice your nonverbal communication skills: some of these we’ve already discussed in this section such as smiling and nodding your head when you agree with someone, but there are others that are easy to try such as, improving your posture, making eye contact, making a point of not taking sneaky glances at your phone while in a meeting. Each of these low hanging fruit could be tried straight away. If you want to keep things really simple, you could start by taking just one of them and practicing it for just 30 minutes each day, before moving on to try another. Emotional intelligence or EI is the ability to recognize your emotions, process and understand them, and observe how they affect those around you. Having a high emotional intelligence means you not only understand your own emotions, but you also understand other people’s emotions. Read More: in our guide to emotional intelligence. Improving your ability to manage and deal with stress can lead to better interpersonal skills outcomes. For example, a person who suffers from enough nerves before giving a presentation that it actually affects their performance will give an improved performance if they are able to keep their emotions in check. Being assertive isn’t about being forceful, but it is about being able to stand up for both yourself and others in a way that others can respect. To be assertive you need to be open and forthright as to your needs whilst respecting the needs, rights, and views of others. This involves working within a group, contributing ideas, sharing responsibility, being assertive, giving constructive feedback, and learning from and accepting feedback. Whether you’re looking to become a better team member or whether you’re looking to put together better teams, then a good place to start is by learning about Belbin Team Roles. Continuous improvement is a structured process whereby we continually try to make a known process better. First used in industry, where it is also known by the name Kaizen. One tool we can borrow from Kaizen to help us improve our interpersonal skills is the Deming Cycle, sometimes known as the Plan Do Check Act cycle. Another useful tool is to plan our goals in such a way so that the outcome is separated from the performance. Read more about Goal Setting here. Interpersonal skills are defined as the ability to communicate or interact with another person. They are skills we use every day as we interact with both individuals and groups. People with great interpersonal skills are generally more successful both professionally and personally than those without. The good news is that regardless of the level your interpersonal skills are at right now, they can be improved by following the tips in this article, namely to tackle the easy wins first, work on your emotional intelligence, stress management, assertiveness, and team working. Finally, continually assess your progress and put together a new plan so as you continue to make progress.